The rural population is consistently less well-off than the urban population with respect to health. Differences between the two populations are not always substantial, however. The rural population is more likely to engage in risky health-related behaviors and to experience higher rates of chronic conditions and activity limitations. 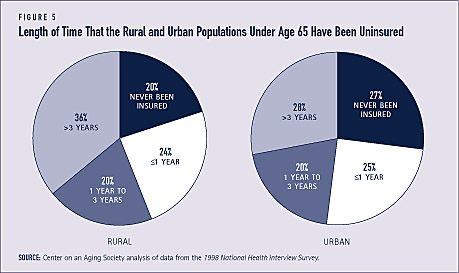 Rural residents are also more likely to be uninsured for longer periods of time, and are less likely than urban residents to receive some types of health care, including tests for various chronic conditions. Limited access to health care in rural areas is generally associated with the fact that there are fewer providers. This Profile compares people who live in a metro-politan statistical area (MSA) to those who do not (non-MSA). People who reside in a MSA are referred to as urban residents and those who live in a non-MSA are referred to as rural residents. About one-fifth of the U.S. population resides in a rural area. Larger differences between the rural and urban populations may be masked as a result of the way the data are reported. The use of broad “urban” and “rural” categories may mask some differences because of the substantial variations in population size and density. For example, a rural area may refer to a county with a city of 10,000 or more, or to a frontier area which has an extremely low population density, usually fewer than 6 people per square mile. 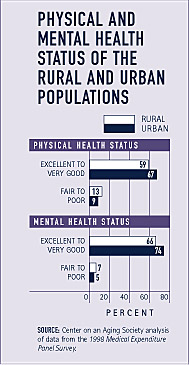 A larger proportion of the rural population than the urban population reports fair to poor physical and mental health. For example, the proportion of rural residents reporting fair to poor physical health is almost one and a half times the proportion of urban residents. Differences in the proportions of adults in rural and urban areas with specific chronic conditions are small, but the pattern is consistent. 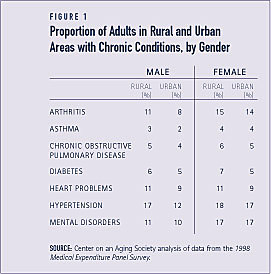 The proportions of adults in rural areas with chronic conditions are slightly larger than their urban counterparts. For example, somewhat larger proportions of rural men and women report heart problems, compared to their urban counterparts (see Figure 1). One-third of adults in rural areas, compared to less than one-quarter of adults in urban areas, report that they are limited in performing a major activity such as paid work, housework, or school. Among persons age 18 and older, larger proportions of rural residents than urban residents also report limitations related to social, recreational, or family activities. Adults in rural areas are also more likely to report physical limitations. Some 14 percent compared to 9 percent in urban areas say that they have a physical limitation including difficulty walking 10 steps, 3 blocks, or 1 mile, lifting 10 pounds, standing for 20 minutes, bending or stooping, reaching over their head, or using their fingers to grasp (see Figure 2). 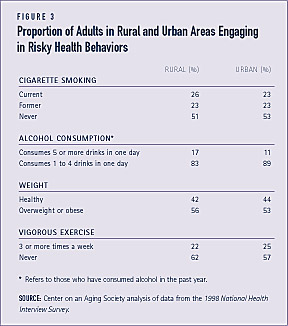 Overall, slightly larger proportions of adults in rural areas, compared to those in urban areas, engage in risky health-related behaviors. For example, 26 percent of those residing in a rural area, compared to 23 percent of those residing in an urban area, currently smoke. And among adults who have consumed alcohol in the past year, a larger proportion of rural residents consume an average of 5 or more drinks in one day. 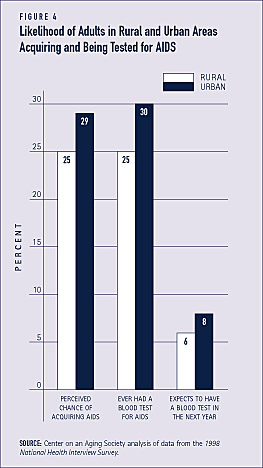 Rural residents are also more likely to be overweight or obese and to abstain from regular exercise (see Figure 3). In general, smaller proportions of adults residing in a rural area than those residing in an urban area are screened for various types of cancer, including prostate, breast, colon, and skin cancer. Among men ages 50 and older, for example, some 82 per-cent of rural residents and 87 percent of urban residents have had a prostate exam. Also, half of urban residents age 50 and older have had a blood stool test for colo-rectal cancer, compared to 42 percent of rural residents age 50 and older. Over one-third of rural residents, compared to about one-quarter of urban residents, have been uninsured for more than three years. A larger proportion of urban residents have never been insured, however (see Figure 5). Median total health care expenditures for the rural population — $434 — are slightly higher than those for the urban population — $418. 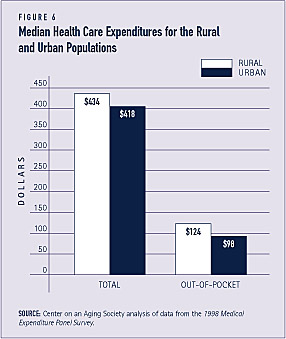 Rural residents pay a larger proportion — 29 percent — of their health care costs out-of-pocket than do urban residents — 23 percent (see Figure 6). The rural population is somewhat more likely than the urban population to use hospital services, including emergency room visits and overnight hospital stays. Some 10 percent of rural residents, compared to 8 percent of urban residents, have stayed overnight in the hospital in the past year (see Figure 7). The scarcity of primary care physicians in rural areas is one factor that may contribute to greater use of hospital services. Telemedicine offers the potential to provide health care services across vast distances to underserved urban and rural areas. Telemedicine is the use of electronic communication and information technologies to provide clinical care at a distance. It can provide individuals in rural areas access to teleconsultations with health care providers and specialists that otherwise may not occur. Telemedicine may also help attract and retain health care providers in rural areas by providing ongoing training and interaction with other providers. 1. National Rural Health Association (1997). HIV/AIDS in America. Rural Areas with HIV/AIDS.” Journal of Rural Health, 18(2): 337-47. 3. NRHA (1999). Access to Health Care For the Uninsured in Rural and Frontier America. 4. North Carolina Rural Health Research Program (1997). Facts About…Rural Physicians. Washington, DC: Federal Office of Rural Health Policy, U.S. Dept. of Health and Human Services. 5. American Psychological Association (2000). The Critical Need For Psychologists in Rural America. 6. CDC (2001). 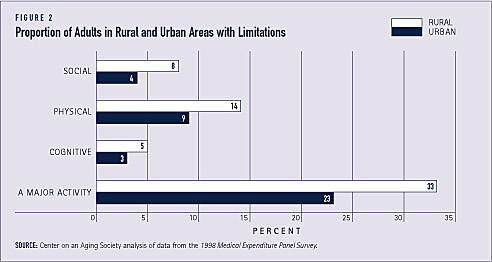 Health United States, 2001: Urban and Rural Chartbook. Hyattsville, MD: NCHS. 7. Schlenker, M. et al. (2002). “Rural-Urban Home Health Care Differences Before the Balanced Budget Act of 1997.” Journal of Rural Health, 18(2): 359-72. 8. MEDPAC (2001). Report to the Congress: Medicare in Rural America. Washington, DC: MEDPAC. 9. Center for Medicare and Medicaid Services (June 5, 2002). Medicaid and Telemedicine. 10. Orloff, T. (1998). State Challenges and Opportunities in Rural and Frontier Health Care Delivery. Washington, DC: National Governors’ Association. Unless otherwise noted, the data presented in this Profile are from two national surveys of the United States civilian non-institutionalized population. The National Health Interview Survey (NHIS), conducted annually by the National Center for Health Statistics, is the principal source of information on the health of the U.S. population. The 1998 Medical Expenditure Panel Survey (MEPS), cosponsored by the Agency for Health-care Research and Quality and the National Center for Health Statistics provides national estimates of health care use, expenditures, sources of payment, and insurance coverage.